This recipe is adapted from Carol Fenster, from her cookbook, 125 Gluten-Free Vegetarian Recipes” (Avery/Penguin Group, 2011). 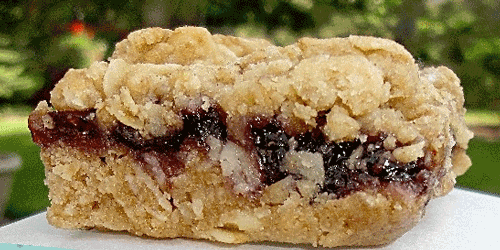 The gluten-free oat crumble combined with the sweet blueberries makes for a delicious and easy dessert option. I know what I’m bringing to my next bake sale! Blueberries, cinnamon, and walnuts team up with rolled oats and oat bran to make a hearty, flavorful bar that is also quite versatile. Feel free to change the filling, as it's equally delicious using raspberry, fig, or strawberry jam. Or, use your favorite nuts such as pecans, almonds, or pine nuts. These bars also vegan and freeze and travel well. Place rack in middle of oven. Preheat oven to 375. Generously grease 8-inch square nonstick (gray, not black) metal pan, or line pan with aluminum foil, leaving 2-inch overhang for easy removal. Grease foil. In medium bowl, combine melted butter and 1 teaspoon vanilla. Stir in flour blend, rolled oats, brown sugar, oat bran, walnuts, xanthan gum, baking powder, salt, and cinnamon until thoroughly blended. Press 1 ½ cups of mixture firmly on bottom of pan. Stir remaining teaspoon of vanilla into blueberry jam until smooth, then spread evenly on top. Sprinkle remaining oat mixture evenly on jam, then pat to make smooth and even. Bake until top is lightly browned and firm, about 20-25 minutes. Cool bars in pan for 30 minutes on wire rack. If using foil lining, invert pan onto large cutting board and remove foil before cutting into 16 squares. Otherwise, serve bars directly from pan.